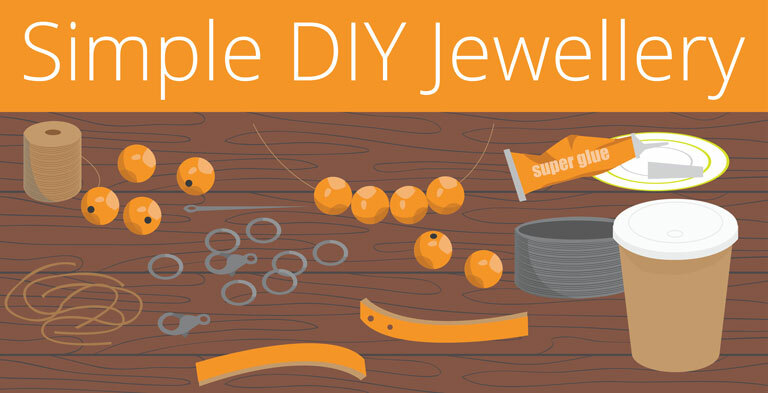 With Internet becoming a big part of our lives, we now have access to a wide range of tutorials, tips, and step-by-step guides on how to make DIY jewellery. Unfortunately, many of the seemingly simple pieces are in fact not simple at all. In most cases jewellery making requires some degree of practice if you want your piece to actually be wearable. With that being said, we at Cape Watch have decided to try out a few of the most commonly homemade jewellery types. Some of which are considerably easier than others. At the end of it we really did enjoy the process and wanted to share this experience with you. We started with the one that we thought would be the least amount of work (and we were right). All we did was take some fishing line to string together a combination of colourful beads, and tied it all together with a simple necklace clip. Alternatively you could just use a piece of elastic and tie the two ends together once all your beads are in. This seems to quite a popular one recently. The simple version is to take a few thin strips of leather and tied it together with a necklace clip. Many people (especially the men) prefer this clean, undecorated style. However, you can customise these bracelets with beads, letters, numbers, and charms to give it some uniqueness. When it comes to using glue, things can get messy. However, sometimes the temptation for a bling hairclip or an eye-catching brooch is just too much. The advantage of an adhesive is that you can stick any ornament of your choice onto any surface. We decorated a plain hat with feathers and fake jewels. We must admit though, the result was slightly messy and definitely had room for improvement. This one will definitely take some skill. It involves using jewellery quality metal wires and bending them to the shapes you require. There are endless applications such as bangles, rings, earrings and chokers just to name a few. What we made was a simple ring with a pearl bead stringed onto the top. The two ends were then sealed with a small jewellery-welding machine and polished. or those of you who have plenty of time to kill, why not try a hand woven jewellery piece. We braided a range of colourful strings and ropes, using different patterns and styles. To give the final product some flare, we also stringed beads and crystals into the braid. The entire process did take quite long because the weave pattern took some time to learn, but the end results were definitely worth it. As a specialised jewellery equipment supplier, making these DIY pieces was actually not all that hard. After all, we already had the equipment and materials ready at hand. The process was enjoyable and some of us even went home to make more jewellery with our children. We found it to be a good team bonding experience and also a great activity for kids’ parties.